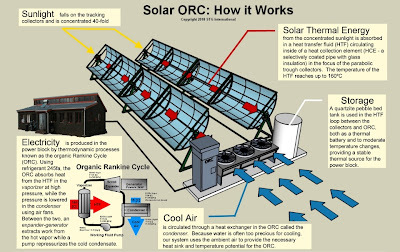 Tech Center: A Solar- powered system that's a Reverse air-conditioner to develop power for Developing world. A Solar- powered system that's a Reverse air-conditioner to develop power for Developing world. In the developing world, electricity and other resources necessary to run clinics are difficult to achieve and many a times costly to produce. In many African countries electricity from the grid is very inconsistent and unavailable in rural parts. So medical centres and clinics in these areas rely on Diesel generators or Photovoltaic solar cells for power, now these are costly propositions and require recurring cost of fuel and maintenance. Also places in Africa that fall in the temperate regions face very cold winters and Hot water becomes a necessity. Health worker avoid washing hands as the water supply gets very cold thus creating unhygienic conditions. A startup by the name STG (Solar Turbine Group) international established by alumni students of MIT have come up with a seemingly effective solution to the problem. 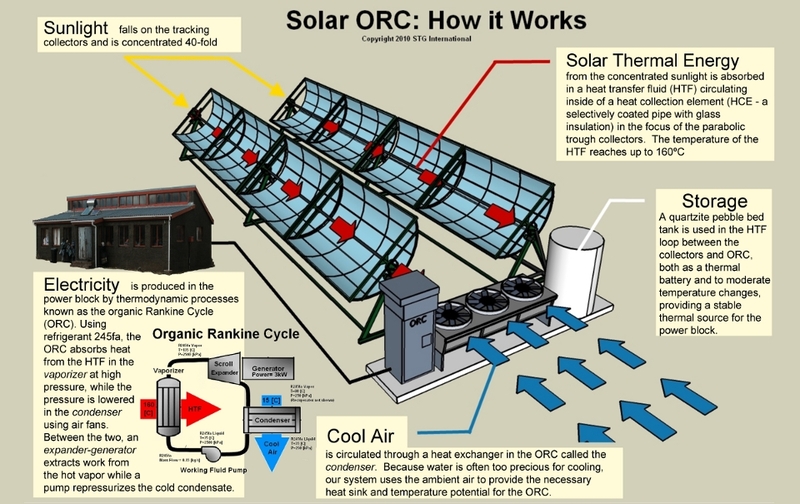 The Technology is called Solar ORC and is somewhat similar to one those Concentrated solar power systems. It utilizes parabolic mirror reflectors that look like troughs. At the centre line of the these troughs lies a metal pipe which carries a HTF (Heat transfer fluid) inside. Now this HTF absorbs the heat from the concentrated sunlight and this results in raising the temperature of the HTF upto 160 degree Celsius. This heated HTF now enters into an ORC unit/ORC engine, it works on an Organic Rankine cycle (Its a Rankine cycle except it works on Refrigerant rather than water as working fluid) . It works like a reversed air conditioning unit. Instead of utilizing electricity to cool the air and throw hot air outside. It actually uses the hot HTF and the cold ambient air to produces mechanical work which is converted into electricity. The key element of the system a device called a scroll expander, which convert the heat difference into mechanical power is described in a paper to be published in the ASME Journal of Engineering for Gas Turbines and Power. Here are some of the technical specification of the unit that has been installed and currently functional. Matthew Orosz, President, Director and the lead author of the paper on this project says the idea for the project began years ago, when he spent two years working in a village in Lesotho as a Peace Corps volunteer with no access to electricity or hot water. There are about 30,000 clinics and 60,000 schools worldwide that lack access to electricity but have sufficient sunshine to meet their power needs. This makes the project a perfect fit for these places. Another advantage is the system being self reliant. After developing the first system in Lesotho back in 2008, which provided the reliability of the system to operate in remote locations. The STG team has now also developed a computerized control system, allowing the system to run virtually hands free; there is no need for a skilled operator. Once that system is installed, the only routine maintenance required is washing the huge mirrors every six months. Over the years, this project from STG has won numerous awards and grants to help develop the technology, the financing systems and the supply chains using local materials and labour is what sets this project aside. It utilizes existing systems and hardware. The project has also won the MIT IDEAS Global Challenge competition, followed by a grant from the World Bank, an Echoing Green Fellowship, a Conoco Philips Energy prize and others. The team’s ongoing research and development work will be aided by grants from the MIT Energy Initiative, the National Renewable Energy Laboratory and the Government of India through IISc-Bangalore.